Firstly a HUGE thank you to Joan Park Community Gardens who graciously welcomed us to complete our scientific research in such a glorious setting! And to Emily Looke, Griffith University Service Learning student intern for her meticulous research & dedication to this project. 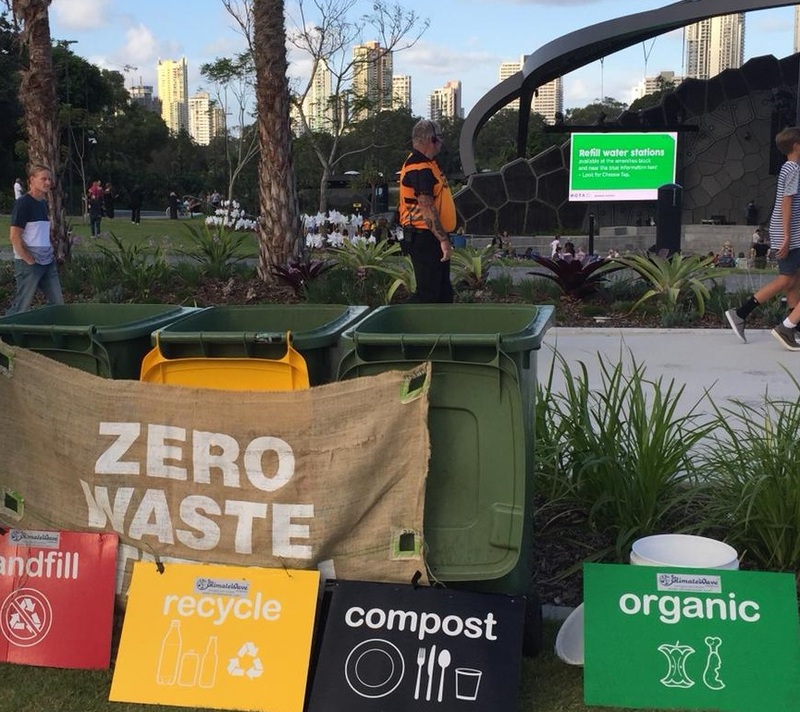 On the 24th of March 2018, Climate Wave Enterprises aimed for a zero-waste event at the exciting Concert for the Planet, Earth Hour event held at the Home of the Arts on the Gold Coast. Almost all food stalls at the event participated by providing compostable catering products such as bowls, cups and cutlery for the concert-goers to minimise single-use plastics and our impact on the environment. A team of 14 volunteer Eco Angels assisted Climate Wave in educating the attendees the correct bin to dispose of their waste/resource and how it will be processed, reused & recycled. At the Concert for the Planet event, 30 attendees (from approx. 1500) were surveyed on their thoughts, opinions and experiences with single use plastic & compostable catering products. 57 percent didn’t know the event had compostable catering products. 47 percent had not attended an event with compostable catering products. 90 percent of respondents said they had not attended an event that had been free of single-use plastics. 97 percent of respondents said they would prefer to use compostable catering products over single-use plastics. 85 percent of respondents said they would be more inclined to go to a café if they provided compostable cups instead of plastic cups. Educating attendees that the event had no single-use plastic and is minimising landfill is always important as it lets the attendees think about their waste and its possible impact on the environment. Implementing reusable or compostable catering products and phasing out single use plastics may actually be of benefit to a business and leave more satisfied customers. Using the Concert for the Planet event as an example, Climate Wave Enterprises in conjunction with Surfrider Foundation Ocean Friendly Business program are reaching out to cafés on the Gold Coast to phase out single-use plastics and utilise reusable or compostable catering products. The compostable waste can be donated by cafés to community gardens to be used in their compost. The Concert for the Planet was a successful waste management event and it’s exciting to see how easy and simple it is for the community and for businesses to minimise waste and single-use plastics. At this event we achieved a 72 % waste diversion rate from landfill. If you’d like more information about the process please read this story and to follow our Griffith University Intern Emily Looke who is monitoring the breakdown of the compostables over the next few months at Joan Park Community Gardens see our Facebook Photo Album. Following the study, it can be concluded that the paper compostables take between 1 week (napkins) to 3 months (coffee cups) to biodegrade. For the ‘plastic feel’ forks and cups, these will take much longer to biodegrade if not done in a commercial setting due to their durability. It was found that the shredded items biodegraded slightly faster (by approximately 1 week) than the full compostable items due to their surface area, but shredding is not necessary if composting time is not restricted. At the Concert for the Planet event, 30 attendees were surveyed on their thoughts, opinions and experiences with compostable catering products. More than half the respondents (57 percent) did not know the event had compostable catering products. More than 90 percent of respondents said they had not attended an event that has been free of single-use plastics and 47 percent have not attended an event with compostable catering products. Letting attendees know that the event has no single-use plastic and is minimising landfill is always important as it lets the attendees think about their waste and its possible impact on the environment. Implementing compostable catering products and phasing out single use plastics may actually be of benefit to a business and leave more satisfied customers. A high 97 percent of respondents said they would prefer to use compostable catering products over single-use plastics, and 85 percent of respondents said they would be more inclined to go to a café if they provided compostable cups instead of plastic cups. Switching to biodegradable, compostable packaging can give companies an investment in a better future for everyone and business; it can give a business an edge and show customers the changing world to more sustainable packaging, as well as the care for the environment by the company. Purchasing biodegradable products lowers a company’s CO2 emissions and reduces the amount of oil used to produce inorganic plastic products. Using the Concert for the Planet event as an example, Climate Wave Enterprises in conjunction with Surfrider Foundation are reaching out to cafés on the Gold Coast to phase out single-use plastics and use compostable catering products. The compostable waste can be donated by cafés to community gardens to be used in the compost. The Concert for the Planet was a successful waste management event and it is exciting to see how easy and simple it is for the community and for businesses to minimise waste and single-use plastics.